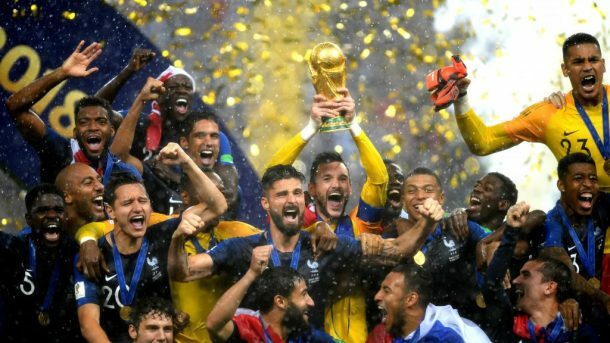 A penalty-kick goal from Antoine Griezmann and goals from Paul Pogba and Kylian Mbappe were enough to lift one of the pre-tournament favorites to the title, capping off a magnificent run in the group stage and the knockout stage that featured wins over Australia, Peru, Argentina, Uruguay and Belgium. Here's everything you need to know about Sunday's wild final. It didn't take too long for this one to get going. Despite Croatia playing better in the first half, a mistake gifted the lead to France. Mandzukic headed the ball into his own goal 18 minutes in on a set piece to make it 1-0. Mandzukic became the first player to score an own goal in the World Cup final. For those counting at home, there have been 20 World Cup finals before Sunday's match. Mandzukic heads it into his own net to give France the 1-0 lead. His shot takes a slight deflection past Lloris to make it 1-1. The Frenchman slots home the penalty to put France back up 2-1. Griezmann scored from the penalty spot, which meant he did his signature Fortnite dance celebration, as seen in the popular video game. The "taking the L" dance has been a celebration of Griezmann's for a few months, debuting it with Atletico Madrid during the La Liga season. More on that here. Pogba puts France up 3-1! Croatia, trailing every knockout stage match this Cup, had to do something to try and comeback but it couldn't find the creativity in the final third. Instead, Mbappe ended it. The young Paris Saint-Germain star made it 4-1 with this stunning hit atop the box 65 minutes in. The 19-year-old becomes the first teenager to score in a FIFA World Cup final since Pelé. Oh no Hugo Lloris, what is you doing? 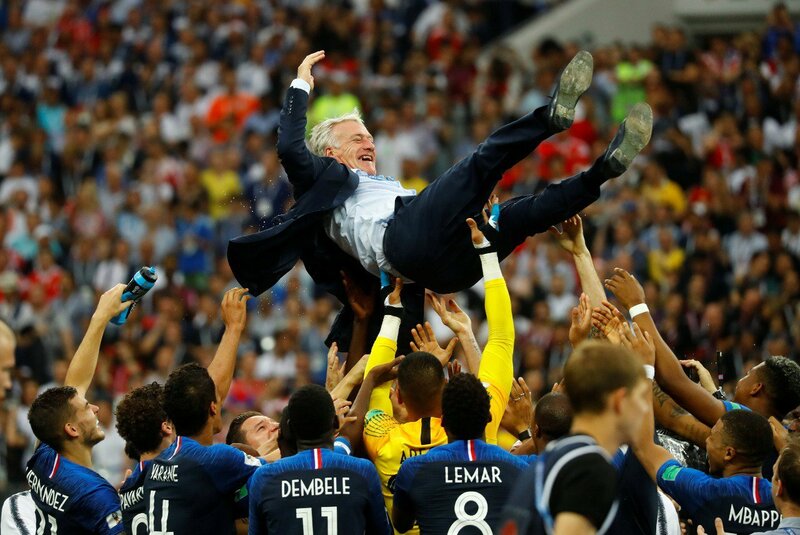 Didier Deschamps joins Mario Zagallo and Franz Beckenbauer as the only to win the men's World Cup as a player and manager. Zagallo was a champion for Brazil as a player in 1958 and as a manager in 1970. Beckenbauer did the same as a player for West Germany in 1974 and as a manager in 1990. As if that wasn't enough, there was a pitch invasion during second half of the match. Approximately four spectators invaded the field before security did its best to stop them. As always, it's a huge concern when you think of the safety of those involved but it was quickly handled and play continued. More on that here. In the end, it was destiny for France and heartbreak for Croatia, who was playing in its first final. 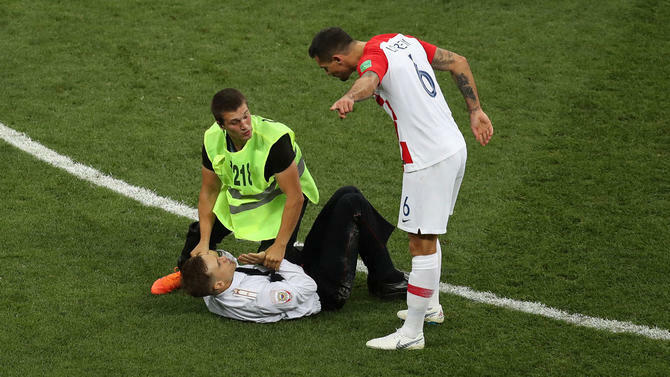 A wild World Cup concluded with a team everyone thought could win actually doing so, while Croatia's miracle run falls painfully short. There could only be one winner, and a deserved France team managed to step up with its most convincing showing of the tournament when it mattered most.